One of the largest New World monkeys, Spider Monkeys get their name from their tendency to stretch like a spider high up into the trees. They are easy to recognize with their long limbs and a unique tail that is longer than their body. The tail is used as a fifth limb for support and swinging in the tree, but also provides an advantage to the monkeys by allowing them to hang from their tails and grasp hard to reach fruit. Isolated spider monkeys (Ateles geoffroyi) likely lower the pitch of their calls to improve the chances of re-establishing contact with their group, according to a study published April 3, 2019 in the open-access journal PLOS ONE by José D. Ordóñez-Gómez from the German Primate Center, Germany, and colleagues. Spider monkeys live in groups and communicate with out-of-sight group members using vocalizations known as whinnies. They are known to vary the pitch, or frequency, of their whinnies, and in this study, the authors analyzed whether such variation relates to the relative social isolation of the caller. They also assessed whether listener responses changed depending on the frequency of the original whinny. Between February and June of 2016, the authors followed a group of 27 female and 8 male adult black-handed spider monkeys in the Lacandona Rainforest of Mexico, recording the monkeys whenever they came within 20 meters of their microphones. For the purposes of this study, callers were defined as isolated if more than 40m from other adult monkeys — otherwise, the caller was defined as being within a subgroup. After analyzing 566 whinnies from the 35 monkeys, the authors found that callers outside a subgroup produced whinnies with a lower fundamental frequency than those produced by spontaneous callers within a subgroup. Since lower-frequency calls travel longer distances, this may improve the monkey’s chance of re-establishing contact with their group. The authors also found that listeners responded more quickly to lower-frequency whinnies, and themselves used lower-frequency whinnies when there was a greater separation distance between callers. Previous studies have shown that aroused spider monkeys tend to produce lower-frequency calls, and the authors suggest that socially isolated spider monkeys might experience higher arousal, which could explain the lower-frequency calls they produce. More research is needed to investigate this link; regardless, these results indicate that spider monkeys do lower the pitch of their calls when socially isolated. This 11 February 2019 video shows striking workers in Matamoros, Mexico expressing solidarity with United States workers in Detroit opposing General Motors mass sackings. A second wave of wildcat strikes continues to expand in Matamoros, Mexico, and is beginning to spread across the country. Sparked by the tens of thousands of workers at 45 maquiladora plants who rebelled last month against the pro-corporate trade unions, tens of thousands more are launching their own struggles after workers in Matamoros won a 20 percent wage increase and a $1,700 bonus. 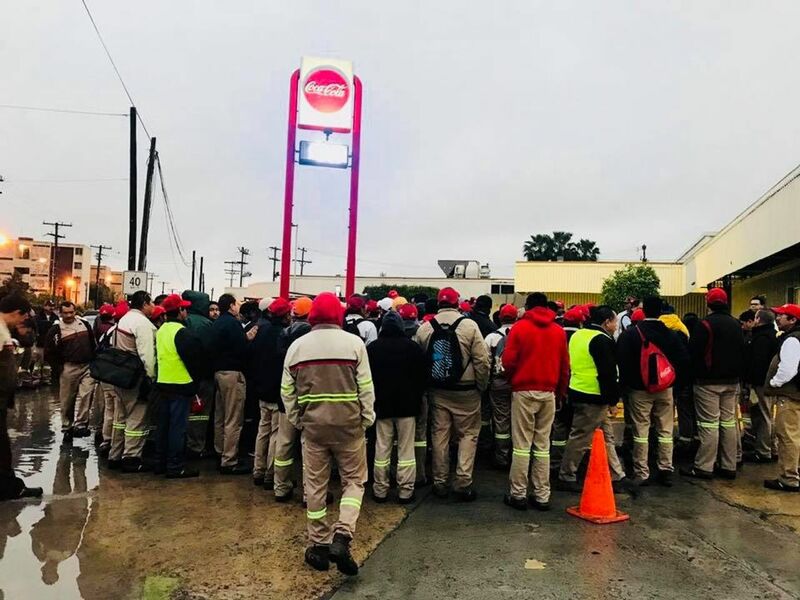 Inspired by the initial wave, 20 additional maquiladora plants in Matamoros that were not initially on strike began their own wildcat strike last Tuesday and were joined by workers at the Coca-Cola bottling plant, three supermarkets, trash collectors and workers from other sectors. The wildcat wave is spreading throughout the country. Last Thursday, 680 workers at a General-Mills plant in the city of Irapuato of the central Mexican state of Guanajuato launched a four-day wildcat strike against two unjustified firings and called for the establishment of a new contract with paid vacations and improved conditions. Negotiations are ongoing. Meanwhile, workers at the five national campuses of the Autonomous University of Mexico (UAM) are entering their tenth day of a strike to demand a 20 percent wage increase … . As the strike wave grows in Mexico, the ruling class is warning of a “contagion” and carrying out a brutal counter-attack in Matamoros. The local maquiladora association, Index, announced last week that companies have fired more than 1,500 workers who participated in the strikes and that they plan to layoff 25,000 more within three years. The strike wave in Mexico is part of a resurgence of militancy among workers internationally … . Yesterday, 5,600 Denver teachers started their first strike in 25 years, continuing a wave of strikes by tens of thousands of teachers across several US states against decades of austerity and privatization. Similar to the struggle in Matamoros, Mexico, this strike was triggered by wildcat strikes in West Virginia, Arizona and Oklahoma organized through social media. State and corporate attacks escalate against workers in Matamoros, Mexico. By Andrea Lobo, 22 February 2019. This 5 February 2019 video, in Spanish with English subtitles, is called Mexican worker Luis sends message of support to Detroit march to fight General Motors plant closures. On February 9 at 2 p.m. EST, the WSWS Autoworker Newsletter is co-hosting a demonstration in Detroit to fight plant closings, mass layoffs and concessions. For more information about attending the demonstration, go to wsws.org/auto. As the powerful strike of Mexican maquiladora workers grows in the border city of Matamoros, workers on the picket lines issued calls in support of the Steering Committee of the Coalition of Rank and File Committees’ planned demonstration against job cuts and concessions at GM headquarters in Detroit on Saturday, February 9 at 2 pm. On Monday afternoon, a mass assembly of workers at several new plants rebelled against their union, the Industrial Union of Workers at Maquiladora and Assembly Plants (SITPME), and called for a general strike. Responding to this call, thousands of workers at 22 maquiladoras joined the wildcat strikes yesterday, with a dozen more plants discussing further walkouts. 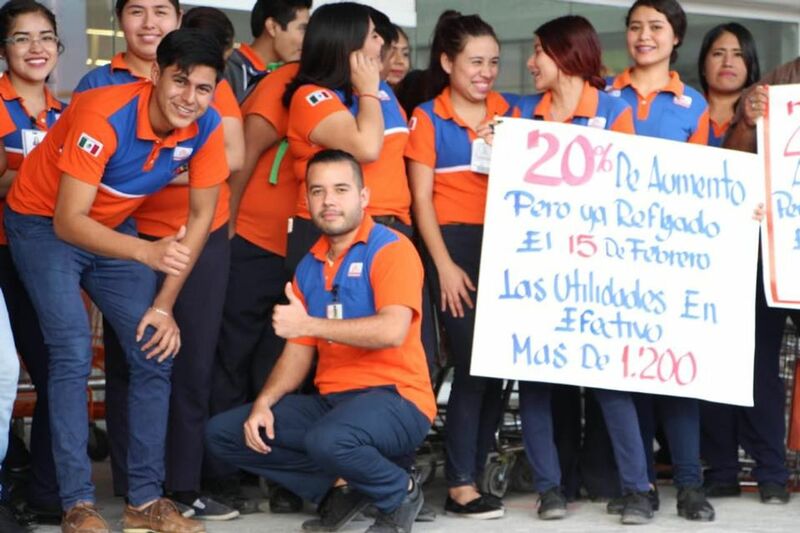 At the Smart and Chedraui supermarkets, workers decided to join the strike, demanding 20 percent wage increases and a bonus of $1,700. Retail workers at the mega chains Soriana and Walmart are also discussing joining the strike, which would bring far broader sectors of the city’s economy to a halt. In total, there are at least 35 companies on strike in Matamoros. “We got organized. The union didn’t support us. In order to begin this strike, we had to organize within the plant at each of the three shifts. We picked between two or three people at each line and that is how we formed a committee of our fellow workers. In my case, three of us were elected from one line and two from the other. Then, the first, second and third shifts formed a committee, we entered to negotiate with the manager and we didn’t get a favorable answer and that is why we walked out. After two full weeks of wildcat strikes among 70,000 workers in defiance of the union and management, and one week of a “legally-sanctioned” strike, 41 of the 48 companies have folded to workers’ demands for a 20 percent raise and a $1,700 bonus. Seven of the original plants are still on strike and workers at several of the factories that went back to work after winning their demands are now discussing another walkout to reverse the more than 600 firings orchestrated by the companies as reprisals and as a maneuver to avoid paying the promised bonuses. Workers in some plants are demanding democratic workers’ control over hiring and firing. The time has come to stand up and fight. Workers from all different industries must make the decision to attend the demonstration on Saturday, February 9 at 2 pm in front of GM headquarters in downtown Detroit. WSWS Labor Editor Jerry White spoke in front of the GM world headquarters in downtown Detroit, and answered questions from local news reporters about the upcoming March to Fight GM Plant Closures, to be held at the same spot this Saturday, February 9. This 12 January 2019 video is about striking workers demonstrating in Matamoros, Mexico. The strike of tens of thousands of Matamoros workers spread beyond the maquiladoras this week to new industries as workers in water purification, milk production, and Coca-Cola bottling walked out of their Matamoros workplaces Thursday and Friday. 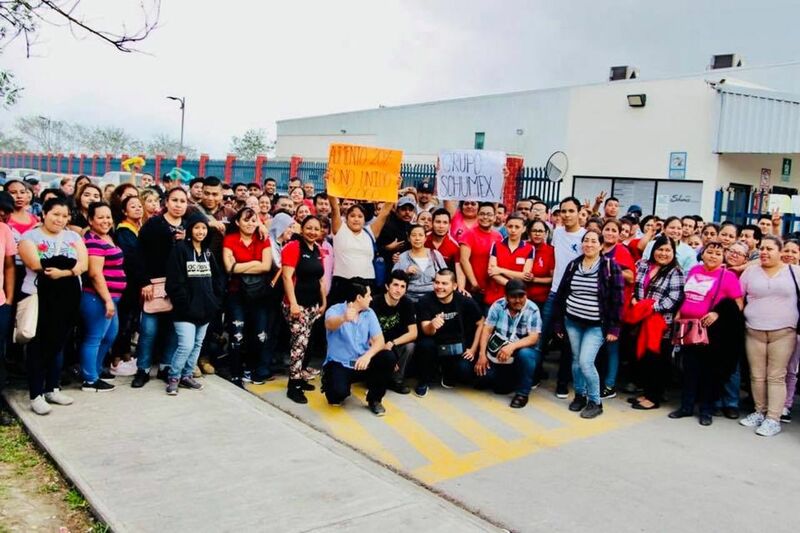 Several additional auto parts maquiladoras also joined the strike at the end of the week, including at Spellman, Toyoda Gosei Rubber and Tapex. Although over a dozen plants have returned to work after the companies granted the 20 percent wage increase and $1,700 bonus, more than 25 remain on strike, costing the mostly US-based companies a whopping $37 million per day. At the same time, a strike of 30,000 teachers in the state of Michoacan neared the end of its third week with thousands of teachers blocking train tracks linking industrial hubs with the critical Pacific ports at Lázaro Cárdenas in Michoacan and Manzanillo in Colima. Last Monday, thousands of teachers in Oaxaca joined the strike. The Mexican ruling class is terrified of the growing strike movement. In an article titled “The end of labor stability”, Mexico’s main business paper, El Financiero, warned on Thursday that “not in decades has Mexico been presented with 44 strikes in only one blow.” In comparison to recent weeks, the six-year presidential terms of Vicente, Felipe Calderón and Enrique Peña Nieto saw only 49, 40 and 23 strikes respectively. The industry website Manufactura.mx reported that a corporate representative said industry workers were “contaminated” by the demands for a 20 percent wage increase and that companies anticipate the strikes will spread. The business representative said, “We have an excellent relationship with the union” and hoped the union would help the company avoid a strike. Workers are both excited by the growth of the strike and concerned that the companies plan to betray whatever agreement they reach. “At Autoliv, they are firing a bunch of people without severance or bonus. The manager fires workers and mocks them, telling them that they are not going to pay their bonus or severance. They are being sent to the conciliation and arbitration board and are told that they’ll have to wait half a year or a year to resolve things. Obviously this board is on the side of Autoliv. Though the US business press is beginning to report on the impact of the strikes in Mexico from an economic standpoint, the websites of the International Socialist Organization (ISO) and Socialist Alternative as well as the Democratic Socialists of America’s (DSA) Jacobin magazine have all ignored the strike entirely. This 26 January 2019 video in Spanish is about the Matamoros strike. The massive strikes by maquiladora workers in Matamoros, Mexico, have brought to public light the highly exploitive conditions faced by those laboring for global auto parts makers and other manufacturing industries along the US-Mexican border. There are 345 “Tier 1” auto suppliers with a presence in Mexico, according to a recent report by ProMexico, an organization set up by the Mexican government to promote international trade and development. Some 65 percent in direct investment in Mexico is in auto-supply-related industries. The profits extracted off the backs of Mexican workers are a source of enormous enrichment for stockholders and CEOs of the transnational auto parts suppliers, many of them based near Detroit, Michigan. Auto parts production in Mexico is closely integrated with the global car market, with many of the parts made in Matamoros and other cities shipped to the US. The border crossing at Brownsville, Texas, handled trade worth $14.7 billion in 2017. Auto parts are Mexico’s second leading export, behind petroleum. The following are profiles of just a few of the multinationals and leading personalities involved in auto parts production in Mexico. Aurora, Ontario-based Magna is the world’s fifth largest auto parts manufacturer, with $39 billion in sales in 2017 and pre-tax income of $3 billion. It recently opened a plant in Querétaro, Mexico, to manufacture molded and exterior parts. It employs some 24,000 workers in Mexico at 30 different facilities including in Matamoros. Don Walker, Magna CEO, is one of the most heavily compensated executives in Canada, with $20.4 million in salary. In addition, he has $25.4 million in stock options that he has not exercised and $10.2 million in stock-based wards that have vested but not been paid out. Lear Corporation, based in Southfield, Michigan, has some 46,000 employees in Mexico and operates 23 plants, according to one report. It recorded sales of $21.1 billion in 2018 and net income of $1.15 billion. In 2017, its top five officers took in some $34 million in executive compensation, including former president and CEO Matthew Simoncini who alone received $14.8 million. Autoliv, based in Auburn Hills, Michigan, outside of Detroit, bills itself as the world largest automotive safety supplier. It has manufacturing plants in Tijuana, Matamoros and Lerma, with three manufacturing plants in Querétaro, and employs a total of 11,000 in Mexico. It makes airbags, seatbelts, seatbelt webbing and airbag cushions. 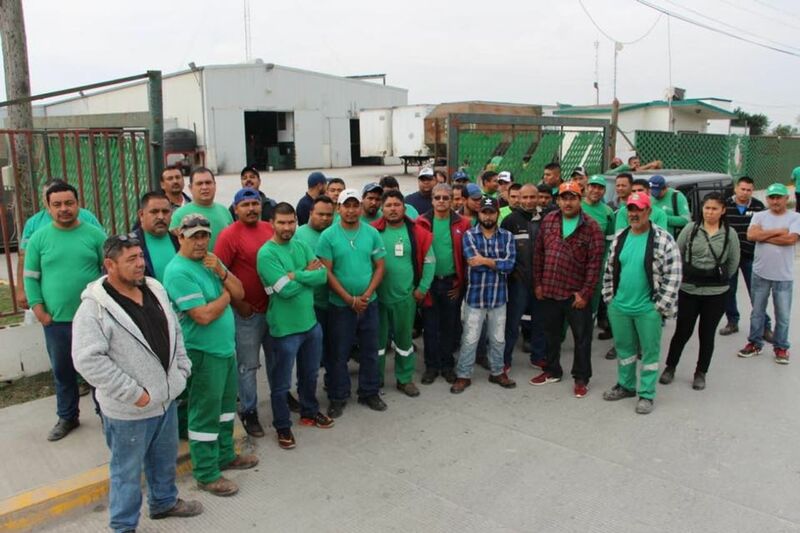 Workers at the Autoliv plant in Matamoros were among the first to go on strike, and workers now report the company is firing workers in retribution. The company reported pretax income of $506 million in 2017 on sales of $10.4 billion. Mikael Bratt, president and CEO of Autoliv, pulled in a relatively modest $1.7 million in executive compensation in 2017. Mats Backman, Autoliv chief financial officer, made $1.5 million. French-based auto parts maker Faurecia operates 14 plants employing 10,000 in Mexico. The company recorded $24.17 billion in auto component sales in 2017. It is the sixth largest auto component maker in the world and produces seats, interior systems and emission control technology. The company’s US operations were recently the subject of an exposure by the World Socialist Web Site Autoworker Newsletter. Typical of the rapacious character of global auto parts manufacture is Dura Automotive. Its Matamoros factories produce parking brake cables and body engine release cables and other components for major auto manufacturers including Ford, Fiat Chrysler, General Motors, Honda and TRW, Subaru and KIA. The owner and CEO of Dura, Lynn Tilton, is described by Forbes as a “self-made woman,” with estimated net worth of $830 million. As founder and owner of private investment firm Patriarch Partners, she buys distressed companies, carries out brutal downsizing and then sells them for a profit. In 2016, the Securities and Exchange Commission filed fraud charges against Tilton and Patriarch Partners alleging that the true value of funds it managed were hidden from investors. Tilton reportedly commutes to her New York office by helicopter and “owns homes in Florida, Arizona, Hawaii, and an Italian villa on Lake Como, just up the mountain from George Clooney,” valued at $60 million or more. In an interview with Forbes, she boasted of owning $25 million in jewelry and another $10 million in aircraft. She reported that she has a reality show about her business (“Diva of Distressed”) in the works with the Sundance Channel. She showed the Forbes reporter a statement from her accountant of assets like gold, silver and cash totaling $544 million. Tyco International is another multinational conglomerate with operations in Matamoros. It merged with Johnson Controls in 2016 to form Johnson Controls International plc. The company’s former chief financial officer, Mark Swartz, and former CEO, Dennis Kozlowski, were convicted in 2005 of crimes related to the receipt of $81 million in unauthorized bonuses, the purchase of $14.7 million in art and the payment by the company of a $20 million investment banking fee to a former Tyco director. Another Tyco executive, Edward Breen, who replaced Kozlowski, got a golden parachute when he left his post as CEO of in September 2013, with compensation, retirement pay, stock and other perks valued at more than $150 million. Breen, who remained Tyco chairman, got an additional $30 million as a lump sum pension payout in 2016, Tyco says. He has since been named CEO of Dupont, where he received 2018 compensation of $13.7 million, and also serves as a director of cable giant Comcast. Another major player in the auto parts industry in Mexico is International Automotive Components Group IACG, formed by now US Treasury Secretary Wilbur Ross in 2006. Ross became notorious as an asset stripper, buying distressed companies and then imposing major attacks on workers and retirees. He worked with the United Steelworkers union to rob tens of thousands of retirees of their pensions at LTV Steel and other companies. A ferocious advocate of trade war within the Trump administration, the firms Ross operates exploit the labor of workers all over the world. The single-minded drive by the Trump administration to scapegoat immigrants and to build a wall with Mexico is bound up with the determination of the ruling class to keep workers in Canada, Mexico and the US divided in order to be able to more efficiently exploit their labor. Following the Delphi bankruptcy Miller spelled out a vision in which low wages in China, Mexico and other less-developed countries should set a standard for slashing wages and pension benefits in the US. He called decent pay, defined benefit pensions and retirement after 30 years of employment an anachronism that American business could no longer tolerate or afford. At the same time as he was slashing jobs and pay for workers, Miller became notorious for handing out hefty compensation packages to Delphi executives. Miller himself received a multimillion-dollar signing bonus when he was hired as Delphi CEO just months before taking Delphi into bankruptcy. This is the background of the strikes by workers in Matamoros who have courageously sought to pry back a tiny portion of the profits extracted by the transnational corporations. This 22 January 2019 video is about striking workers marching in Matamoros, Mexico. The largest strike in two decades in North America continues among tens of thousands of “maquiladora” workers in Matamoros, Mexico. Workers bravely rebelled two weeks ago against the pro-capitalist … trade unions to carry out wildcat strikes for decent salaries, unpaid benefits and an end to the sweatshop standards at their plants. Luis Daniel Prieto, a young worker from the city of Lagos de Moreno, in the central Mexican state of Guanajuato, learned of the rebellion in Matamoros through the WSWS Twitter page. He was inspired by the courageous and independent stand taken by Matamoros workers and wanted to share his story. After several low-wage jobs, including working at a Burger King, Luis Daniel, 34, worked for one year as a toll-booth collector. One afternoon, he learned from a radio commercial and from researching online that ICA, the company administrating the highway, was stealing thousands of pesos in owed benefits from each worker. Once his paycheck arrived with 200 pesos ($US10) for yearly benefits, he refused to sign the consent form and sought to convince other workers to protest. After a week of these efforts, he was summarily fired. “The anger after years of being exploited by corporations, that is when I vomited out all the ‘labor hangover’ from my whole life,” he recounts. Luis Daniel decided to sue ICA at the local Conciliation and Arbitration Board in León, Guanajuato, to expose their financial records “for my fellow workers to realize what was happening.” After eight months of fighting for his case and running out of money, he accepted a settlement of 23,000 pesos ($US1,200) offered by the company. He decided in September 2016 to open a Facebook page called “La pocilga laboral de Lagos de Moreno” (Labor Pigpen of Lagos de Moreno) offering to accompany workers fighting against abuses by employers. “On the one hand, we carried out demonstrations. On the other hand, there were legal complaints,” Luis Daniel explains. Luis Daniel was contacted by workers from very diverse sectors—from agricultural fields, warehouses and housemaids to those at the newer manufacturing plants—all facing similar contract violations and other abuses by employers. He would encourage workers to denounce and publicize their complaints through the Facebook page, while they pursued lawsuits. This came increasingly at odds with the companies and their established institutions. Luis Daniel said he waited until the police left and then went to denounce the allegations, which he said are false, at the office of the local human rights ombudsman, José Mavio Ramírez Trejo, who simply dismissed his complaint. On January 31, 2018, he protested outside of the factories of Nestle and Dräxlmaier—a Germany-based auto-parts supplier— against the non-payment of wages for a security employee sub-contracted by the company Sevige. That evening, he said, two thugs went to his home to beat him with a metal pipe. His attackers only fled when a neighbor came out to his aid. He filed a report at the local prosecutor’s office which he says was later dismissed again by the human rights ombudsman Ramírez Trejo, who claimed his office couldn’t file a report unless he had spent several days hospitalized. “I kept accompanying the worker to his protests until, towards the end of May, I came out of my house and my car was on fire. I don’t know who did it, but for me those responsible are still Nestlé, Sevige and Dräxlmaier because they began acting belligerently toward me when we would go and protest at their plants,” Luis Daniel added. “My experience is proof that workers’ rights here are violated by companies, corrupt governments, corrupt human rights and corrupt conciliation and arbitration boards. They even refuse to comply with the corrupt contracts and deals they themselves imposed,” he remarked. Listen to what Detroit autoworkers had to say about the wildcat strikes by auto parts workers in Matamoros, Mexico. Autoworkers across the world are fighting back. Join the Feb 9 Detroit rally to stop GM plant closings, layoffs and concessions at General Motors headquarters!